By mid-January 2019, when a massive snowfall led to the closure of Jammu and Kashmir highway, one of the stranded passengers was a lonely lady, Kubra Geelani, 28, a just-divorced woman. With tears in her eyes and distress quite visible on her face, she stopped near three Kashmiri speaking men in Udhampur. “When I saw her, she was alone, shattered and without money,” says Syed Ajaz, in his late forties, one amongst the three men. The trio hired a tempo till Ramban. Then they trekked up to Ramsoo amid the deadly landslides. But the landslides and the falling stones became invisible for Syed Ajaz as Kubra started narrating her ordeal. Actually, a Pakistan administered Kashmir’s (PaK) resident, Kubra had come to Kashmir with her husband, Muhammad Altaf Rather, an ex-militant, a resident of Panzgam (Kokernag), under 2010 rehabilitation scheme announced by the then chief minister Omar Abdullah. She was part of around 350 families who availed this policy. The couple took marriage vows in 2010 and came to Kashmir in 2014 in search of ‘better’ and ‘secure’ living. But the relationship ended on November 30, 2018, with a divorce as Kubra couldn’t give birth to a child. In an ‘alien’ space with no blood relation in Kashmir, Kubra is literally without a roof over her head. She has no source of income either. To survive she says she either begs or work as domestic help. She is longing for her home; though close-by, but far away actually. A resident of Domail (Muzaffarabad), Kubra then 17, was married to Rather when she had passed her ninth class. It was an arranged marriage managed by her father Syed Lateef Hussain Geelani, a local Imam and an ex-serviceman. Rather, her husband was associated with Hizb ul-Mujahideen, but after their marriage, he gave up his affiliations and started a livestock business. 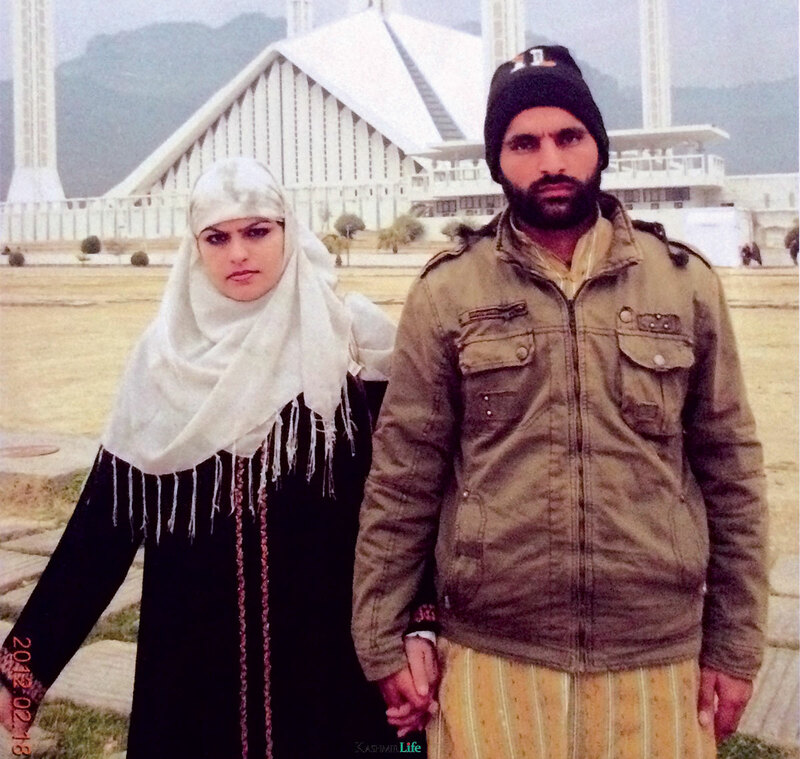 A file pic of Kubra Geelani and her ex-husband Altaf Ahmad Rather in Islamabad, Pakistan. Towering and well-built, Kubra has sharp long eyebrows. She was excited to meet her in-laws in south Kashmir. But to her utter shock, Rather’s house turned out to be in Panzgam village of Kokernag, almost 22 km from the main district Anantnag (Islamabad). “That was my first shock, but still, I decided to manage everything as I was at my dream place,” Kubra said. At Sogshali Panzgam, Kubra started living with her mother-in-law, brother-in-law, younger to her husband, and Rather’s uncle. Both the brothers were in the livestock business. For the next four years, it became difficult for Kubra to manage her expenses as a result of which she started working as a domestic help in many well to do houses in the district. She said they used to pay her and even give her clothes. “I was managing it myself but then my husband decided to give me divorce as I couldn’t give him a child. He had the support of his family who wants him to marry another girl,” Kubra said. It is the same reason mentioned in her divorce deed, and ironically, the papers confirmed she was paid Mehr of Rs 1.5 lakhs at the time of her Nikah but after the divorce, she was not paid any alimony. Desperate to go back home, Kubra said, she met all the leaders– the Joint Resistance Leadership (JRL), former chief ministers, Omar Abdullah and Mehbooba Mufti. “They all promised me they will help, but so far, they have done nothing,” she said. “See I don’t even have a roof over my head now.” Kubra is staying with a family of her married friend where she earlier worked as domestic help. 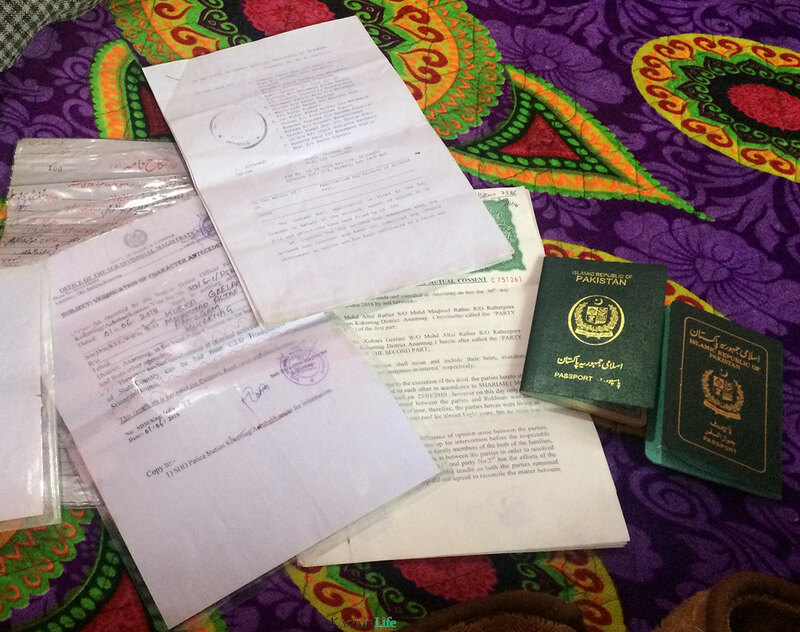 Divorced and then orphaned, Kubra took all her documents and visited Delhi for a meeting with Pakistan Embassy. By the time she reached Delhi, it was already late and she decided to stay overnight in Delhi. Shattered Kubra decided to come back to Kashmir, and on her way, she got stranded due to the closure of the highway. After listening to Kubra’s ordeals, Syed Ajaz offered her the family’s hospitality. “I told her she is my daughter or a sister and I mean it,” Aijaz said. After reaching Kashmir, Kubra first visited her friend in south Kashmir and then reported to Syed Ajaz’s north Kashmir residence, where she is putting up since then. The family greeted her as if she is their blood relation. Syeds want Kubra to live with them till any decision is taken about her return by the higher officials but she says she will be going back to her friend in south Kashmir. Ever since her divorce Kubra says her ex-husband has not contacted her to know if she is alive. “She keeps on weeping whole night and then her blood pressure shoots up,” said Aijaz’s wife. 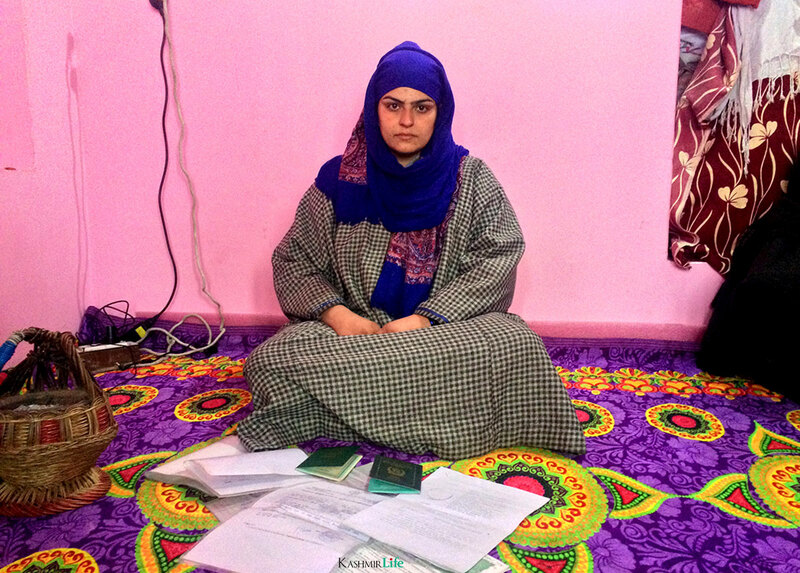 Amongst the 350 families of ex-militants who returned under Omar Abdullah’s scheme, Saira, a resident of Karachi now living in Kupwara, says most of the ladies among them are undergoing treatments for depression. Kubra is longing for her parental home in the other part of Kashmir but she is not allowed to go. Her family in PaK including her mother, sister and two brothers are also desperate to get their daughter back. “My father was ill for nine months; when he wanted to see me, I could not go. After his death I am living with nightmares that what if my mother also dies waiting for me,” says Kubra. While recalling her days in Panzgam, Kubra said their decision to return from PaK was a wrong step. “We were living a dignified living there. I guess my husband had the same opinion about this,” Kubra said. 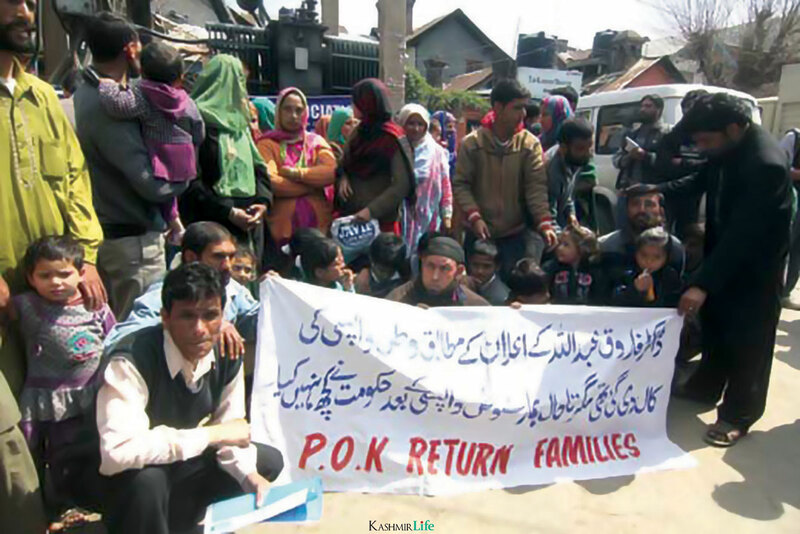 A file photo of the families who returned back from Pakistan administered Kashmir protesting in Srinagar against government apathy.